NASA has extended the Kepler mission through fiscal year 2016, adding four years to Kepler’s search for Earth-like planets in the Milky Way galaxy and allowing LASP to continue our work operating the spacecraft. 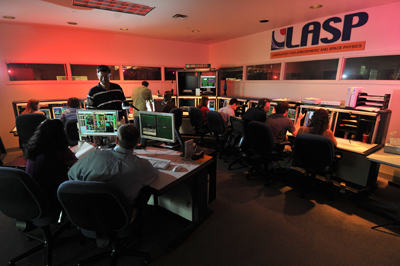 A team of 20 University of Colorado students and 16 LASP professionals control the Kepler spacecraft from the LASP Mission Operations Center. The mission’s extension, based on a recommendation by a NASA Senior Review of its operating missions, will allow LASP to continue providing students with hands-on spacecraft mission operations experience. The Kepler mission surveys the galaxy for Earth-sized planets with the potential to support life. To date, the Kepler Science Team has confirmed 61 planets in the Milky Way habitable zone, where liquid water could exist on a planet’s surface.